An agreement between Moscow and Athens for the construction of the “Turkish Stream” gas pipeline, expected to bring up to €5 billion to Greece, may possibly be signed at the start of next week, Greek government sources said on Saturday (18 April). According to an article in Greek financial newspaper Agora, the amount will be an advance on the profits to be made by the Greeks from transit fees. The article said signatures cementing the deal agreed in Moscow during a recent visit by Prime Minister Alexis Tsipras may be placed as early as Monday. 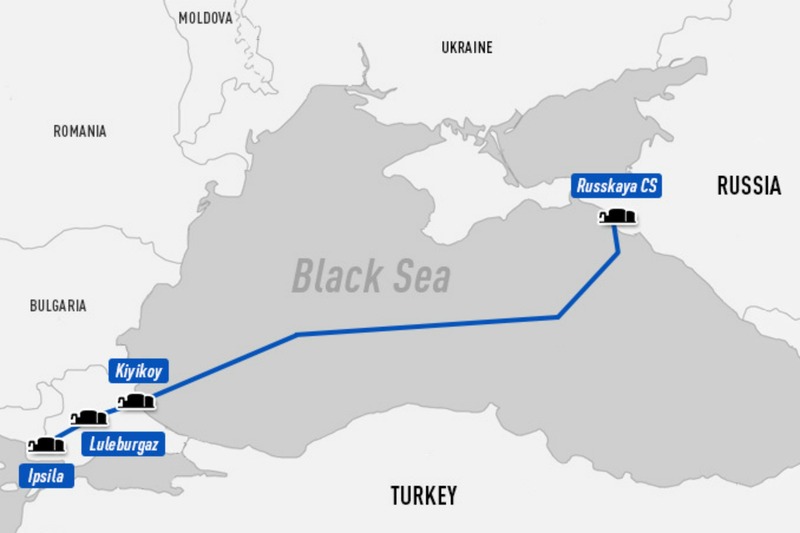 Turkish Stream, which will transport Russian natural gas via Turkey and Greece to the rest of Europe, is expected to be implemented by 2019. But on Saturday, the Russian president’s spokesman Dmitry Peskov said no such loan is planned. “[Russian President Vladimir] Putin said himself during the media conference that nobody asked for our help. Naturally energy cooperation was discussed. Naturally, the parties of the high level talks agreed to work out all details of these issues at an expert level. Russia didn’t offer financial help because it was not asked,” the spokesman told the Russian radio station Business FM. In the meantime, a recording emerged in which Greece warns of a “contagion effect” for world finances if his country is pushed out of the eurozone. “Anyone who toys with the idea of cutting off bits of the eurozone hoping the rest will survive is playing with fire,” he told La Sexta, a Spanish TV channel, in an interview recorded 10 days ago. His comments were recorded before those of Mario Draghi, the European Central Bank’s president, who this weekend said the eurozone was better equipped than it had been in the past to deal with a new Greek crisis but warned of uncharted waters if the situation deteriorates. Greece’s leftist government is trying to negotiate a deal with its lenders from the European Union and the International Monetary Fund to unlock further aid under its €240 billion bailout. Eurozone deputy finance ministers gave Athens last Thursday a deadline of six working days to present a revised economic reform plan. Eurozone finance ministers will meet on 24 April to decide whether to unlock emergency funding to keep Greece afloat. Accuracy and legitimacy should always be the highest priority for any credible and impartial media network. our loan problems might be, here comes your help as we offer loans to both individuals and firms at low and affordable interest rate of 2% Processed within 24 hours.and a repayment duration period of 1 year to 10 years to any part of the world.We give out loans within the range of 5,000 to 100,000,000 USD Just for only one fee, which is the Registration fee while the company will be paying all other fees, Any loan company asking for more than one fee is a scam and beware of that company. Our loans are well insured and maximum security is our priority.contact us today at(harry50loanfirm@gmail.com) where your needs are meet and your worries are over. My name is Elizabeth Forbes from United States. I want to thank Mr John Michaels who helped me to get a loan. For the past three months, I have been searching for a loan to settle my debts, everyone tried to dupe me of my money until I finally met Mr John. He was able to give me a loan of $10,000 USD. He can also help you. He has also helped some other colleagues of mine. If you need any financial help, kindly contact his company through email: aceloanservices@hotmail.com I believe he can help you. Contact him to get help just as he helped me. below are his words of encouragement to those seeking for a legit and honest private loan lender. Do you need a loan for business or personal needs and project funding? Do you want to refinance your business? . We offer a loan for each person or company with an interest of 2% per year. Are you a business man or woman? Are you in any financial stress or do you need funds to start up your own business? Do you have a low credit score and you are finding it hard to obtain a loan from local banks and other financial institutes? the solution to your financial problem is David Wong Lim Loan company From Singapore. Thanks for listening may God help you too. Here comes an Affordable loan that will change your life for ever, I am Dr.Hawkins Robert a certified loan lender, I offer loan to individual and public sector that are in need of financial Assistance in a low interest rate of 2%. Bad credit acceptable,The Terms and Conditions are very simple and considerate.You will never regret anything in this loan transaction because i will make you smile. Our company has recorded a lot of breakthroughs in the provision of first class financial services to our clients, especially in the area of Loan syndication and capital provision for individuals and companies. Banks take into consideration dozens of factors when reviewing a loan application and it can be difficult to fit their exact criteria and get approved. However, there are still options out there for you. Here are 2 alternative options you can pursue that may help you find exactly what you’re looking for. While the government is not the direct lender, it works with microloan providers, banks, and other institutions both local and international and supports entrepreneurs by laying down certain regulations for the lending procedures. You can choose from the SBA Loan, equipment loans, short-term loans, investment loan and many more…. There are several lending institutions that offer small business loans without the strict criteria that banks have. They may be open to funding your business loan despite low credit scores, lack of collateral, or insufficient monthly revenues. Banks are no longer your only option to obtain working capital; and you don’t need to wait for long processing times or submit elaborate paperwork to get approved. Instead, consider using one of the many alternative lending institutions so you can get the small business loan that best fits your business and its needs.